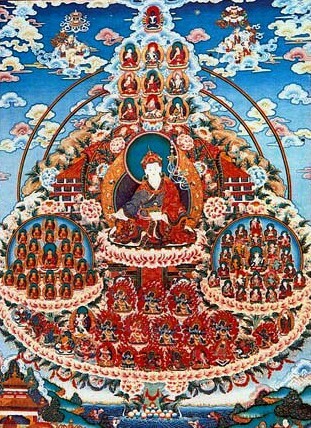 The Dudjom Tersar Ngöndro (Tib. བདུད་འཇོམས་གཏེར་གསར་སྔོན་འགྲོ་, Wyl. bdud 'joms gter gsar sngon 'gro) or 'Preliminary Practices of the New Treasures of Dudjom (Dudjom Tersar) is an abbreviated title for the ngöndro practice entitled Concise Recitation of the Preliminary Practices of the New Treasures of Dudjom (བདུད་འཇོམས་གཏེར་གསར་སྔོན་འགྲོའི་འདོན་བསྡུས་པ།, bdud 'joms gter gsar sngon 'gro'i ngag 'don bsdus pa). A longer ngöndro text by Dudjom Rinpoche, The Chariot of the Path of Union (ཟུང་འཇུག་ལམ་གྱི་ཤིང་རྟ།, zung 'jug lam gyi shing rta), is sometimes referred to as the 'medium-length' or 'extensive' Dudjom Tersar Ngöndro. A terma practice composed and then concealed by Guru Rinpoche himself in the ninth century, the Dudjom Tersar Ngöndro was revealed by Dudjom Lingpa (1835-1904) as part of a pure vision cycle known as Daknang Yeshe Drawa, The Wisdom Net of Pure Visions. Dudjom Lingpa's incarnation, Dudjom Jigdral Yeshé Dorje (1904-1987), known to us as Dudjom Rinpoche, later expanded and clarified the text and taught it widely. This is a concise recitation of the preliminary practices that clearly elucidates the essential meaning and is intended for those who do not understand or are unable to recite the extensive preliminary practices. This page was last edited on 13 July 2015, at 13:45.